Things are going from good to better all the time. The people I am working with are on the whole such great team-players. Everyone who is involved in changing the university’s guidelines to facilitate the open access of digitized theses has been keen to get that little obstacle out of the way. Next step is to contact those past students whose theses we have here in hard copy (some have also been scanned, but that’s another “issue”) to ask them if there are third party copyright or sensitive cultural or other issues that would normally mean placing access restrictions on them. The letter that used to be used for this was 3 pages long and the first page was FULL of thick paragraphs. I have reduced that to a single page table with a few check-boxes and a place for a signature. I have produced a similar one page check-box letter for current students who will be submitting electronic copies to begin with. I’ve had the one page request forms vetted and approved by the copyright-legal advisor and they are all good. Simple, one page, few words, tick the boxes, cover everything, ready to go. So we have had the institutional guidelines being changed and a new more “user-friendly” notice to cover our legal backsides. Next step is to find who has the more likely addresses and send out the notices and ensure the team keeps a record for audit purposes of each of our steps to be able to answer any queries about what steps we took to contact the authors, and how long we waited for a response before the next step, etc etc. I’ve been offered extra staff help to start next week. And the leader of the liaison librarian team has kindly expressed willingness to help out with changing a few bad habits among the academics and teachers who have been asking that we place in our repository those journal articles that are already freely available to students in our databases. Now that’s a waste of time and a costly one, too. So thrilled that the liaison librarian team are willing to help out with this one. And now we have a new request to upload e-readings from about 80 more units. Wow. But no worries. We have extra staff help and once we weed out all of those bad habit requests of repeating and copying what’s already available in databases we will save lots of time. And I am arranging to have the new people who will be assisting with supplying the materials for course readings specially trained to ensure we have a streamlined workflow. Meanwhile I’ve prepared a detailed questionnaire for heads of research centres etc to begin to see how well the university is complying with guidelines set by the Australian Research Council for the management of research data. Next step is to assess the best way to approach all concerned. And I’ve just had an email from an academic interested in promoting national standards for thesis submissions in institutional databases. So looking forward to seeing what I can contribute there. Once this horrid e-reserve or course reading business is taken care of I will be free to get into work on those cultural heritage collections to do something about rescuing those from oblivion. Things are going well so far. All too easy, but that’s largely because of so many great team-workers. Making the most of it while it lasts. Most Australian universities have embraced the practice of (almost) routinely making their higher degree or research theses open access through deposit in their institutional repositories. A CAIRSS (Caul Australian Institutional Repository Support Service) survey last year indicated nearly 80% of responding institutions have mandates or practices for making these theses open access digitally. For what it’s worth here is an edited/greatly truncated version of a request I submitted to have an institution’s guidelines modified/clarified to less ambiguously allow for a more routine deposit of theses into an open access repository. 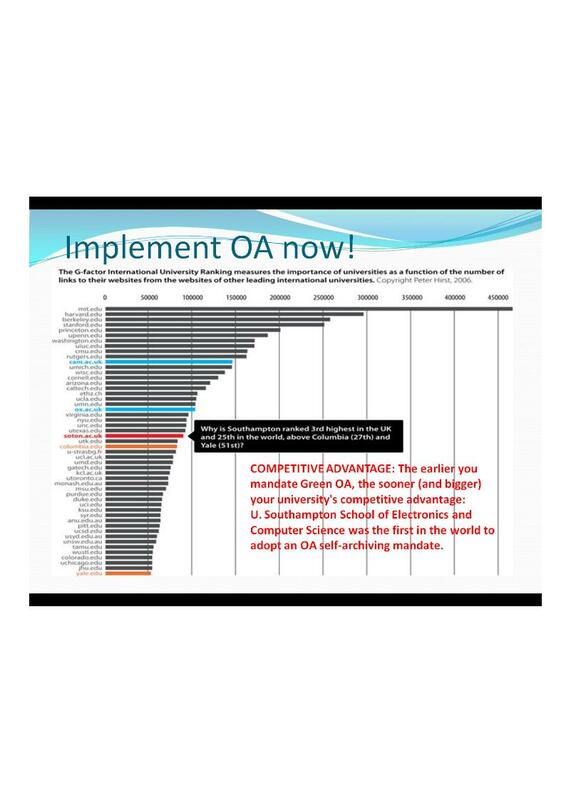 In accordance with a general Australian and global push for open access initiatives (http://www.library.uq.edu.au/bio/openaccess/initiatives.html; http://www.library.uq.edu.au/research/open_access.html) most university repositories (a complete list is found here: http://cairss.caul.edu.au/cairss/repository-manager-tools/repository-software/) showcase their higher degree theses in open access repositories. This is in many cases simply an extension of the past Australian Digital Thesis Program that was superseded by CAUL (http://www.caul.edu.au/caul-programs/australasian-digital-theses) by means of NLA’s TROVE. I still don’t know the technicalities of copyright law on this one, however. “Everyone” is doing it and it’s a good thing, so . . . .